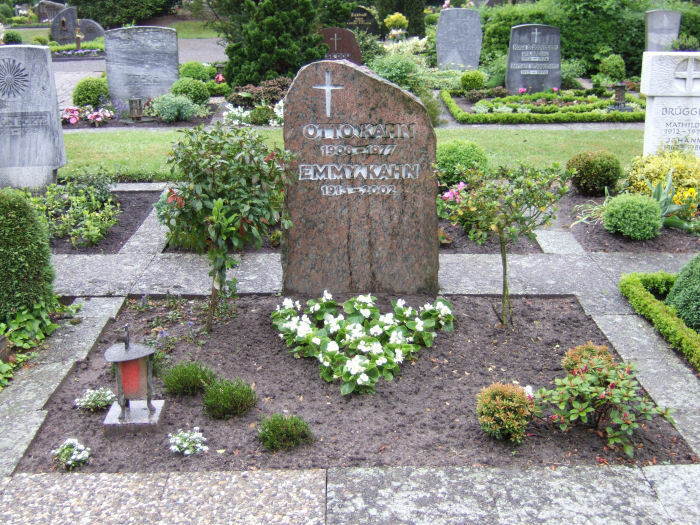 This is the headstone of Otto Erich Kahn and his second wife, it is located in Ottmarsbocholt, 20 km south of Münster in Germany. Contrary to what has been widely thought, he did not seek refuge in Sweden after the war, but lived openly in Germany until his death in 1977. Also note that Kahn had a normal Christian burial as is evidenced by the cross on the headstone and the fact that it is in the local church graveyard. Kahn never renounced his faith or declared himself as being "Gottgläubigkeit" as did so many members of the SS; see by way of comparison the grave of Otto Weidinger who was Kahn's commanding officer after Oradour.